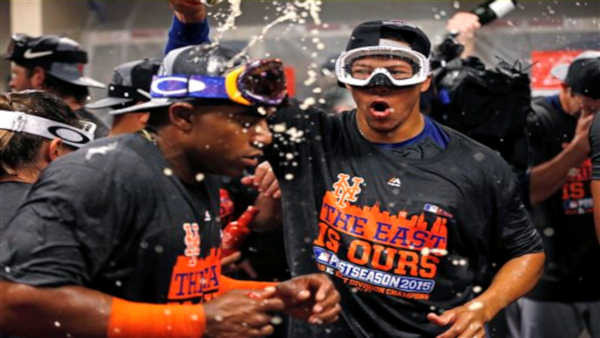 CINCINNATI -- The Mets are back in the playoffs for the first time since 2006. New York clinched its sixth NL East title Saturday by beating the Cincinnati Reds 10-2, getting a late three-run homer from captain David Wright and another dominant start by Matt Harvey. The Mets clinched its sixth NL East title Saturday by beating the Cincinnati Reds 10-2, getting a late three-run homer from captain David Wright and another dominant start by Matt Harvey. Harvey (13-7) was most appropriate to pitch the clincher. He was the NL's starter for the 2013 All-Star game at Citi Field, but needed Tommy John surgery that October and missed all of the 2014 season. Harvey gave up a pair of runs in 6 2-3 innings. When Jeurys Familia fanned Jay Bruce to end it, Mets players streamed from the dugout and formed a celebratory huddle in front of the mound. After two September collapses, the Bernie Madoff financial scandal and nine years of frustration, thousands of blue-clad NY fans along for the trip chanted "Let's go Mets!" 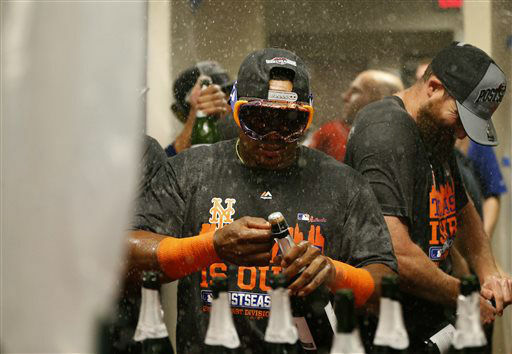 from Lucas Duda's first swing - a grand slam in the first - until the team returned to the field following a champagne celebration to high-five their supporters. The players wore hats with "Postseason" written across the crown. New York will likely face the Los Angeles Dodgers in the Division Series. Duda sparked a warm-up celebration with his first career slam in the first inning off left-hander John Lamb (1-4). Duda had a pair of three-run homers on Friday night. The slam gave him three homers in five at-bats with 10 RBIs. Curtis Granderson added a solo shot, and Wright put it away in the ninth with his fourth homer since returning from a back injury in late August. This title was rather unexpected. Significant injuries and an inexperienced rotation played into Washington's hands as the NL East favorite. But New York bolstered a struggling offense at midseason and beat the Nationals head-to-head while pulling away. It was fitting that they got to celebrate in Cincinnati. New York is 25-15 all-time at Great American Ball Park, the best winning percentage by any NL team, including the Reds. And finally, a long run of seasonal disappointment has ended for the Mets. During their last postseason appearance, they lost Game 7 to St. Louis for the NL championship. They seemed on their way to a second straight playoff appearance in 2007, but blew a seven-game lead with 17 remaining, allowing the Phillies to ascend as the division's top team. The next year, they faded down the stretch again. Then they got mired in a run of six straight losing seasons after they moved from Shea Stadium to Citi Field. This season started ominously as starter Zack Wheeler and reliever Josh Edgin had elbow surgery. A young pitching staff led by Harvey, Jacob deGrom and Familia kept the Mets in contention while the offense struggled with Travis d'Arnaud, Michael Duddyer and Wright hurt. Everything changed at midseason when general manager Sandy Alderson traded for Yoenis Cespedes, Juan Uribe and Kelly Johnson. The infusion of hitters transformed the offense into one of the NL's best. It turned some heads, too. "Certainly when we went out and got Juan and Kelly, the attitude in here changed," said Terry Collins, who heads into the playoffs as a manager for the first time. "All of a sudden guys said: 'You know what? The organization went out and did something because they think we're going to win this.' And I think it changed the entire outlook in the clubhouse." The Mets won 33 of their first 50 games after Aug. 1. They caught and surpassed the Nationals by sweeping them in three-game series from July 31-Aug. 2 and again from Sept. 7-9, building a commanding lead. The big cushion allowed them to space out some of their young pitchers, easing their innings and keeping them fresh for the postseason. Collins has reached the postseason in the majors only once - when he was the Pirates' bullpen coach in 1992 - so much of this is new to him. One of his biggest challenges will be pacing his young pitchers. "One of the things we've had to do that's very uncommon is juggling our pitching," Collins said. "This time of year, it's usually etched in stone. We're not like that." The early clinching gives him a week to get things in order. Mets: INF Juan Uribe might not be available to the Mets early in the playoffs because of injured cartilage in his chest, Collins said. He aggravated the injury while swinging on Friday night and left the game. X-rays were negative. Reds: Manager Bryan Price said RHP Homer Bailey is doing well in throwing sessions that began Sept. 3. Bailey is recovering from reconstructive elbow surgery. Mets: deGrom (13-8) has allowed at least eight hits in three of his last five starts after allowing as many hits only once in his prior 38 starts. It'll be his first career appearance against the Reds. Reds: Keyvius Sampson (2-5) has lost his last four decisions. The rookie has lasted six innings only one time in his 10 starts. It'll be his first against the Mets.